The latest census has revealed a dramatic increase in India’s urban population, especially in the population of its big cities. In 1981, there were 12 million-plus cities, there are 20 now. By the end of the century it is estimated that India will have the world’s largest urban population. Managing the needs of this urban population in a cheap and effective manner will be an enormous challenge before India—perhaps the biggest ever. Sanitary conditions in urban India are appalling and fast becoming worse. Most state and city governments no longer even pretend to manage the problem. An official in the Union Ministry of Urban Development told us that except for the major metropolises, there were no funds to build new sewerage systems. So what should be done? Without claiming to know many of the answers, we would suggest that Pakistan’s Akhtar Hameed Khan’s approach be tried out. Give people the power to construct and manage urban services. To do this, participatory institutions will have to be developed at the mohalla level. We must find socially appropriate technologies for our urban settlements. Can we think in terms of mud buildings instead of brick and cement buildings? Can we think in terms of composting toilets instead of sewers and flush toilets? Can we think in terms of bicycles instead of cars? These technologies will be both equitable and sustainable for our society. Let us take the question of housing. Both bricks and cement are extremely energy-intensive materials and demand mining the land. Even the bulk of our urban population cannot afford the cheapest, low-cost brick and cement building. Why don’t we think in terms of mud buildings? Surely science and technology can improve mud buildings. The question of sewers is similar. This is a technology that emerged during the colonial period in Europe. In India, however, its capital- intensity means that access to it is impossible. Nearly a third of our urban dwellers have no access to toilets, a third only to bucket-type latrines and a third to sewers. Even this last third is largely serviced by community toilets. In most Indian towns sewers are underutilised or choked. 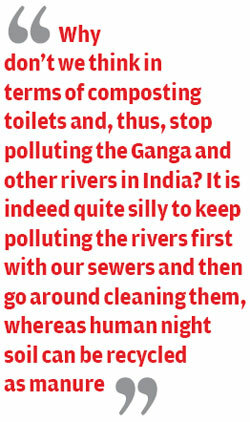 Why don’t we think in terms of composting toilets and, thus, stop polluting the Ganga and other rivers? It is indeed quite silly to keep polluting the rivers first with our sewers and then go around cleaning them, whereas human night soil can be recycled as manure. Cities can, in fact, become major human sources of manure and therefore, a source of nutrients and not just a drain on Indian croplands. To cite just one example, a substantial part of Delhi’s water ends up in flush toilets. The huge volume of wastewater thus generated demands massive public investments in sewage treatment facilities. Polluting technologies are usually cheaper because they externalise the health and resource management costs onto the society and the public. Flush toilets which use more water are, thus, more expensive than those which use less water. Is there not a need to reverse this price mechanism so that customers find it advantageous to purchase more environment-friendly and cost-effective technologies? Can Delhi impose a progressive and high sales tax on all flush toilets which use more water than those which use less? There is clearly a need to look at all natural resource-using and polluting technologies in this manner. Can we also learn from the experience of Chennai and Chennai Refineries and create ªsewage marketsº in Delhi and the National Capital Region? Chennai’s acute water scarcity has forced the refinery—which needs a regular supply of processed water—to actually buy sewage from the city’s municipal corporation and then treat it, at its own expense, to obtain water. This experience shows that Delhi need not look to the central government or any foreign donor for reducing a large part of the current pollution load on the Yamuna. Industries can be made to invest not only in treating industrial wastewater, but also domestic wastewater. It all depends on the pricing and availability of water. The Ganga Action Plan was mainly conceived to deal with the municipal sewage flowing into the Ganga. Industrial sewage treatment was supposed to be managed by the individual firms. But a number of economic problems were not adequately addressed. Treatment cost is high and many municipalities are not able to afford the costs. If the municipalities cannot pay for the operational costs of these treatment plants, river conservation programmes will only demand perpetual subsidies. Only a very small section of the country’s urban population benefits from sewerage systems and this section consists of the richest urban people. There is no reason that the government should subsidise this section. The high cost of sewerage systems means that only a small fraction of India’s population will benefit from them. A large proportion of the urban population in India still uses the open environment for its ablutions. It is an ecologically mindless technology too. Firstly, large reservoirs have to be built or large amounts of river water have to be diverted to supply cities with water that can be flushed down toilets and, then, this water accumulates in the form of concentrated sewage, flows into rivers and destroys the rivers. 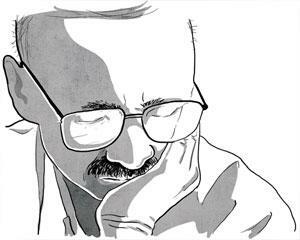 It is, therefore, important to take a long-term view of India’s strategy for human excreta disposal. Various alternatives are being tried out in different parts of the world, which do not use any water, or use very little water. Current research expenditures in this area are next to nothing. The simple assumption of private sector proponents is that if water is correctly priced, it would facilitate private investment and solve the water crisis in the developing world. This argument has many holes. Firstly, current water and sanitation technology, based on the flush toilet and sewage system, would make full cost pricing of water and sanitation services unaffordable by most in the urban South. It is important to recognise that private sector involvement cannot be only in the water supply business. This is just one small and profitable part of the water business. The real cost is in taking back the sewage and treating it to the quality needed for disposal in water bodies. This is the real ªdirtyº business. We know that sewage and drainage costs can be as high as 5-6 times more than the cost of water supply. And with increasing chemical pollution, water treatment costs are only going to increase. 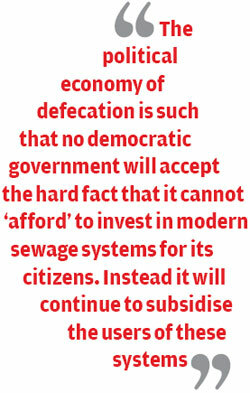 The political economy of defecation is such that no democratic government will accept the hard fact that it cannot ªaffordº to invest in modern sewage systems for its citizens. Instead it will continue to subsidise the users of these systems, in the name of the poor, who would not be able to afford the systems otherwise. It is important to realize that almost all users of the flush toilet and its sewage system are the rich in our cities. Our political system today literally susbidises the rich to excrete in convenience. In fact we get a double subsidy. The logical policy would be to accept the cost and then impose differential pricing so that while the rich pay for the cost of the capital- and resource-intensive sewage and waste disposal technology, the poor pay for the cost of their disposal system, which is invariably connected to the seweage system and hence low cost. But this is easier said than done. We need to think of curbing the urban population influx by providing attractive thought of growing sandal wood trees in rural areas and also providing small scale industries; based on availability of agricultural waste viz. wheat / rice pral ( instead burning the waste)/ availibility of high grass in waste lands etc ; this will make dramatic change in the income of rural poor in coming 10 to 15 years.. Selective families in villages with limited land holding can benefit from such moves.